Oftentimes, when I purchase fresh beets, the tops come with the roots. 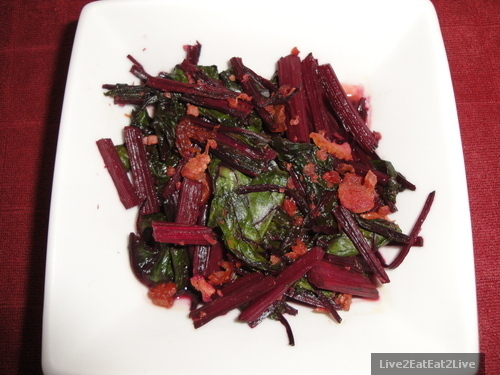 A couple of years ago I came across this recipe: http://simplyrecipes.com/recipes/beet_greens/. Since then, I’ve done variations of that recipe depending on what ingredients I have on hand at the time. This time, after using the beet in a salad (see previous post), I braised the tops with a bit of bacon. I don’t really care for the vinegar in the original recipe. I use Shao Xing wine instead. Also, this time I didn’t have onions. 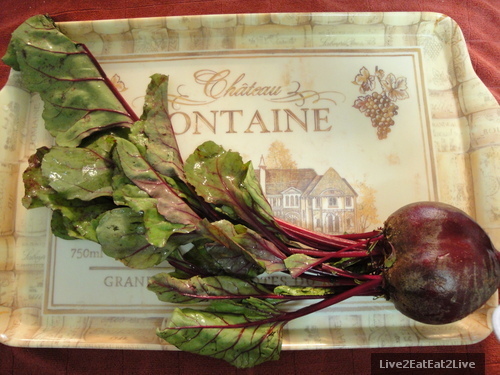 Since the first time I tried cooking beet tops, I include the stems, cooking them a bit longer than the leaves. The stems have a texture like celery, crunchy and slightly fibrous. I’m not sure if it’s because I include the stems, but my beet top dishes usually turn out redder than the picture of others. That’s why the bacon has a reddish/pinkish tinge. I’ve grown to enjoy the beet tops just as much as the roots. 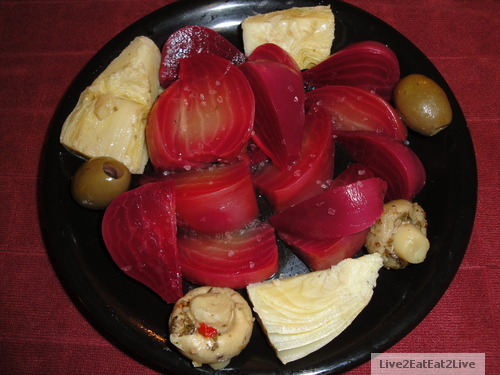 My first experience with beets were sliced beets from a can, smothered with mayonnaise. Since then, my taste has changed. I prefer whole beets over sliced, fresh over canned, no preference between steamed or roasted. For me, the simpler the preparation, the better. Yesterday, I steamed two beets. I didn’t want to fire up the oven for only two beets, plus it was too humid. 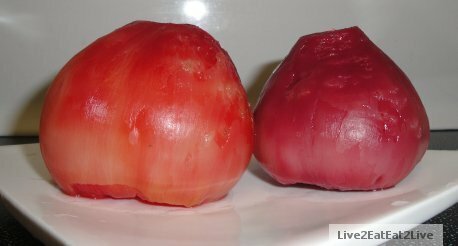 After peeling them, they looked like this. I cut them into wedges and sprinkled olive oil and sea salt over them. For color and texture, I added marinated artichokes and mushrooms and olives I bought from the olive bar at our local Safeway market. This salad did not require much effort but hit the spot. I’m sending this post to Deb at Kahakai Kitchen blog for her Souper Sunday feature: http://kahakaikitchen.blogspot.com/. For the last couple of trips back to Shanghai, we’ve picked up a few of these. 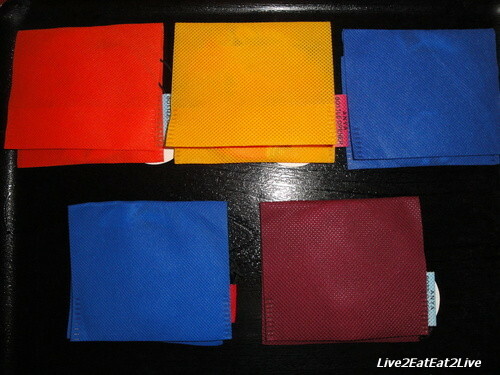 They’re easy to pack, good conversation pieces, handy for gifts, and relatively affordable. 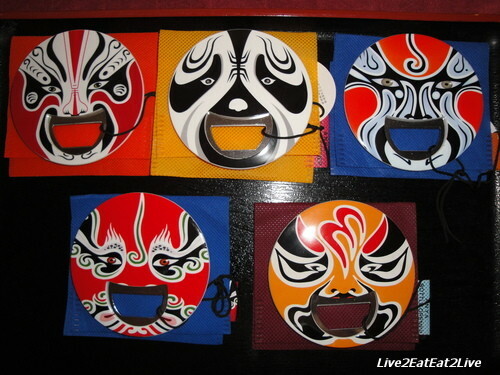 The bottle openers are supposed to be based on Beijing Opera masks. I tried to look them up here: http://www.paulnoll.com/China/Opera/China-opera-set-01.html, but got too dizzy and had to lie down. 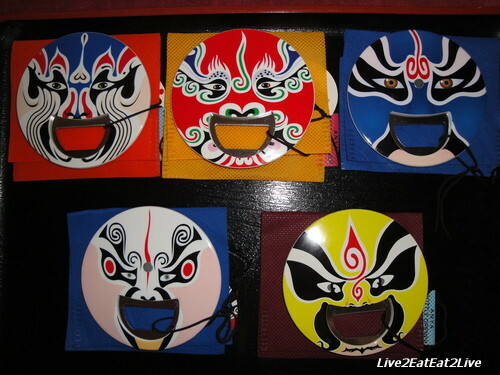 Out of no disrespect to the tradition of the Beijing Opera, I started to call them beer faces because they seem so happy to open beer bottles (and other bottles too). Each bottle opener has a different design on each side.